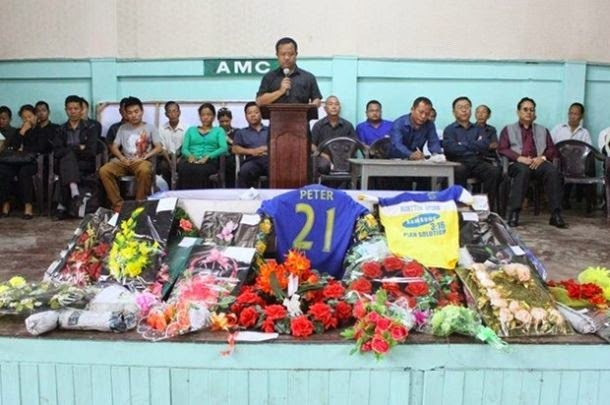 It was meant to be a celebration for the goal he scored for his Bethlehem Vengthlang FC at the ongoing Mizoram Permier League, but Peter Biaksangzuala's joy soon turn into a tragedy when his flip stunt fell short and broke his neck, sources said. "He was trying to do Germany's Klose signature flip stunt, but it misfired unfortunately," sources said. The 23-year-old player was one of the main players during Saturday's match between Bethlehem Vengthlang FC and FC Chanmari West. Biaksangzuala of Khawzawl Vengthar was immediately taken to the Aizawl Civil Hospital and doctors attended to his injuries. Midfielder Peter Biaksangzuala wanted to celebrate Miroslav Klose goal like, but the celebration went wrong. His team was defeated by 3: 2 and Biaksangzuala scored goal for 1:1.